We often write about very cool track ready cars from Lotus just to say, this this car won’t be sold in the United States. However, that isn’t the case with the Lotus Elise Race 250. The track ready toy is also pretty quick. Just how fast is the Race 250? At the company’s Hethel test track the new car was able to manage a lap time of 1 minute 33.5 seconds. That’s 0.5 seconds faster than Elise Cup 220 R.
One would not necessarily think about comparing a new Mercedes SLK 250 and a used Porsche Boxster (986). But when you start to look at them closer you realize that they are actually quite comparable. Both are sports cars that allow for wind in your hair driving. There 0-60 mph times are nearly identical and they both have the same amount of horsepower. The big differences are the engine layout, and engine size as well as the Mercedes offering newer technology. The SLK 250 is also quite a bit more expensive, but being new it comes with a warranty. 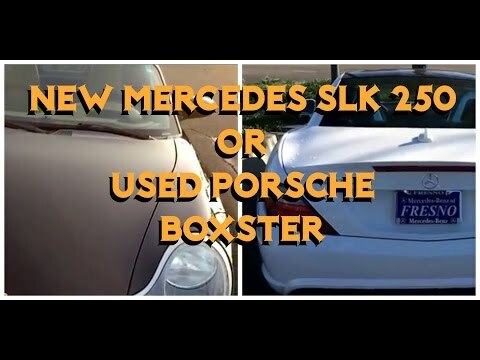 So, which would you choose, the new Mercedes SLK 250 or the used Porsche Boxster (986)?